On November 1st, the Canada Revenue Agency announced that the maximum pensionable earnings for 2019 will be $57,400, up from $55,900 in 2018. Contributors who earn more than $57,400 in 2019 are not required or permitted to make additional contributions to the Canada Pension Plan. The basic exemption amount for 2019 remains $3,500. The 2019 contribution rate for employees and employers has increased to 5.10% an increase of .15%. The 2019 contribution rate for self-employed will also increase to 10.2%. The 2019maximum employer and employee contribution to the plan will be $2,748.90, up from $2,593.80 in 2018. The 2019 maximum self-employed contribution will be $5,497.80, up from $5,187.60 in 2018. Check out our website for a breakdown of these rates and others. Do you have to pay income tax every year when you file your tax return? Enrol now for direct deposit! Thinking of retiring outside Canada and liking the idea of your Canada Pension Plan pension payment deposited directly into your bank account? Get it done easy! Send a written request to the Pension Centre (LINK BELOW) with a void cheque or a document with the IBAN/NUBAN/CLABE number (or bank sort code) and your bank account number. The link below will also take you to a list of participating countries. OHIP+ has a great premise, but the devil may be in the details. The program was created so that children and young people under age 25 get free prescription meds. As good as the universal program is in Canada, one area of concern has always been access to medications. A person who needs medical attention gets free access to doctors, emergency rooms, hospital stays, surgery, cancer treatments, etc. Also, when they are in the hospital, their medications are provided. However, as soon as they go home, they need to pay for their own meds (with some exceptions), which some people are unable to do. So, you get the best doctors in the best facilities, but once you leave the doctor’s office, you are on your own. Until OHIP+ came along in Ontario, that is. Finally kids are covered in Canada’s largest province. It turns out that the program has two very serious issues that is actually interfering with the healthcare of young people. First, if a family has a personal supplementary health insurance plan (to top up the things the universal health system does not cover), then they will very likely have difficulties with OHIP+ coverage. If they have a child who needs regular medication, their personal health insurance will no longer cover that medication. The insurers now tell them to get their meds through OHIP+. But OHIP+ may not cover the specific medication that the doctor has been prescribing. OHIP+ has a list of 4,000 or so approved medications, and they release approval to use some of these drugs in order, from cheapest to most expensive. So, if your doctor prescribes a medication, you are required to try the cheapest drugs first to see if those work. If not, OHIP+ will move you up to the more costly drugs. Consider what that means for a child who is currently being successfully treated with one of the “more expensive” drugs. OHIP+ now requires them to stop taking that drug, thereby risking making them sick (or sicker), in order to experiment on their bodies with a cheaper alternative. If that cheaper alternative does not work, then they can go back to the more expensive drug. OHIP+ is doing this, despite warnings from physicians that the care of patients is being put at risk. If a doctor prescribes Medication A and knows that it works, OHIP+ is second-guessing the doctor and forcing them to experiment with Medications X, Y, and perhaps Z, to save money. If those don’t work, then the patient can go back to Med A. As you can imagine, parents are not pleased. Neither are doctors. For parents, they simply don’t want to put their children at risk of trying different drugs when the current ones are working. They also don’t understand why their personal insurance companies will no longer cover the prescribed medications when their premiums have not gone down. The insurers still charge them for insurance but will no longer pay for meds! Let OHIP+ cover the meds, they say. The second major issue is with the doctors. To get a child on the more expensive drugs (which actually work), they have to spend hours filling out forms justifying their decisions. Then, to make matters worse, they need to fill out those forms at the beginning of every year, to justify the medications for another 12 month period. So much for trusting doctors to make the best health care decisions! OHIP+ is still a new program that covers over 3 million young people. We will monitor and let you know if the government finds ways to streamline things for parents in this situation. Well, the problem has been solved. Canadian Business has a calculator that tells you how old you will be when you die. They ask things like height, weight, parents with heart disease, etc. For me, the answer was 79.6 years. I didn’t like that result, so I reduced my weight and got the same answer. I reduced my height and got the same answer. I changed a few other variables and got the same answer. Hmmmmm. Something smells like Danish fish. So I went to the Sun Life website calculator. They didn’t even bother with silly details like family members who had cardio vascular disease (as if that could matter!). I put in the same numbers as the Canadian Business calculator and got a better result! 85 years! But I thought I could do better, so I went to a calculator offered by a medical doctor (many detailed questions) and got a much better result: 96 years! So, I guess the moral of the story is that if you are planning for retirement, you shouldn’t really trust computer programmers. Or better yet, shop around and find a mortality calculator that you like! Of course, average life expectancy means that at the expected age, 50% of people with that life expectancy would be dead, and 50% would still be alive. And of course, the living 50% won’t all drop dead at that point in time. Many, in fact, will continue to live for quite some time. Actuaries tell us that a non-smoking male who reaches age 84 then has an average life expectancy of 92.5. And if he reaches 92.5, he has an average life expectancy of 96. And so on. So, maybe my plan of surfing in Hawaii during my 90’s is a good plan after all! 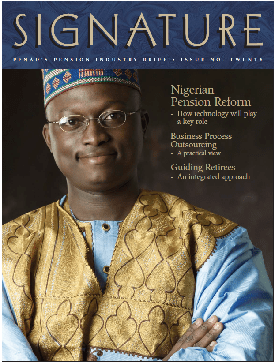 In 2005, Penad had a small part to play in the major pension reform announced in Nigeria in 2003. The Nigerian government set up a national contributory pension scheme to ensure that all Nigerians had the opportunity to save for retirement and build pension accounts. The basic structure was outside the previous Nigeria Social Insurance Trust Fund, which was not adequately meeting the needs of citizens. The new CPS (Contributory Pension Scheme) mandated that all companies with five or more employees must enroll their workers in the scheme, and people who worked for smaller employers also had the option to join. Upon joining, a plan member would choose an administrator from several available and would then be set up with a retirement savings account. This account would be off-limits until retirement, at which point members could draw a pension based on their contributions. Penad’s role in all of this was to act as an advisor to a group setting up one of the administration companies. Our CEO Frank Price and our President Louise Price traveled to Lagos for meetings and to present a keynote at a conference. Cover image from Penad’s Signature magazine after conference in Lagos. Today, thirteen years later, the Nigerian experiment is a big success. Over 7.4 million people from 200,000 companies have joined the CPS, and pension fund assets have grown to over N6.4 trillion, with N30 billion in monthly contributions flowing into the scheme. Over 184,000 people have already retired under the plan and are drawing out pension.